Your chance to Speak up on glued flashlights! I do not like Glued lights and prefer to not buy them. Ok, I am working with Mateminco (the manufacture for Astrolux on banggood) and we have been having a “discussion” about gluing lights. I have been saying that the general public don’t really care about glue but people on BLF care a lot. I have ben trying to talk them into offering an unglued option, even if it possibly costs like an extra $1. I was told I need to show some evidence to this fact before it will be considered. So this poll is the first step. If this fails then the next step is to complain to banggood about the glue on the lights. This might be our only chance to get some of these lights without glue. Vote honestly, if you truly don’t care about glue, then feel free to vote that way. Although I am pretty much positive about what the outcome will be. I hate to ask, would it be possible for you to delete your post so mine can be at the top to give some background on the poll? I did add the option though. I don’t really mind glue… until I do. Typically that’s when I need to change the lens or clean the inside of it (had to do that with two Thrunites, they were horrendously grimy). Still, haven’t had major trouble with glued components thus far, but I’m not an avid modder, so that opinion may still change. I don’t currently have a problem with glue, due to my current inability to mod. I plan on changing that in the future though and I’m sure I will dislike glue then. I do really like option: Glue is great, glue all things! lol even the battery compartment and the light itself to the box! I much prefer non glued lights but it does not affect buying decisions, I will get it open even if it means total destruction! People who do not mod would probably prefer glued though. I would combine the 5th choice with the 2nd choice. I don’t like glue on my flashlights, but if the light is good enough I will buy it and force it open later if I need to. 1. I hate glued lights. 2. I like glued lights. Yeah, 2 choices might be better since I am not sure the language barrier will really show the difference with multiple choices. It depends where you are and the size of the package. I can send a vhs sized box from the USA USPS Priority Mail to China for about $35 (I just did this). Anything bigger jumps up to $75. So most of the time the seller will not want to cover the return shipping. On a $300 light the manufacturer will probably cover the return shipping cost, or at least part of it, so they can fix your light or just send you a new one and fix the first one later on. If your in Singapore or nearby it’s fairly cheap to mail things to China. I don’t like glued lights, even though I don’t mod any more. But I’m not at all opposed to potted electronics. As long as the the manufacturers are clear on the difference. Glue is irrelevant. The decision to buy a light is based on the performance/looks/size out of the box. I may mod it or not. If someone likes it, I give it away or I sell it. Like the song says: wat’s glue got to do with it. And if the led stops working? You just throw it away? Glue is irrelevant. The decision to buy a light is based on the performance/looks/size out of the box. I may mod it or not. If someone likes it, I give it away or I sell it. Like the song says: wat’s glue got to do with it. He is entitled to his opinion. Some people just don’t care about modding or self repair, there is nothing wrong with that. I was just curious what he does if there is any issue. If throwing away just because of glue, that’s a good reason to not have glue. A big light can be sold for half price maybe and someone else can fix it. A cheaper light can be given away to someone to fix. It’s less wasteful. No judgment about throwing it away. I’m sure people throw away unglued lights as well. And it’s also more environmentally friendly. I always prefer no glue. Usually – that preference is quite strong. In some cases I refuse to buy a light because it’s glued. However in most cases it doesn’t block a purchase. I wouldn’t be happy to pay extra to have glue-free light – because “If you pay us this small sum we won’t harm your light” seems like a shady deal. I would feel bad about paying the ransom as well as I would about getting a harmed light. If approached with such option, most likely I wouldn’t buy at all. I feel a bit short changed by the words “just don’t care”. If I buy something, I’d rather whip out a screwdriver than read the manual. I have quite a collection of bits and pieces, even XZN. But I don’t buy things just to warm up my tools. If anything breaks down, I try to fix it. Even if it causes some collateral damage. If I only buy things I can open and fix, my choice will be limited. And yours will be too. Actually, this is a real thing. Lots of companies go out of their way to make sure their products are not repair friendly, Apple cough cough. They don’t publish schematics, label their circuit boards, offer replacement parts, solder the hard drives in (SSD) to prevent replacing them, even brick devices if an update detects a new component inside. All in the effort to get people to buy new devices instead of fix their existing ones. They try to make it super hard for 3rd party repair people (non Apple) to fix their devices. Can you imagine if auto makers welded the hoods shut on cars? Then forced you to go to dealers to have them check fluids and make all repairs? Low water level? Tow to dealer. Plus them not offer any parts to fix things. Only dealers are allowed to work on your car. If repair costs are too expensive, just buy a new car and start over. Greedy bastagizes. Eh, it’s just crazy. We need the Right to Repair law to force companies to allow repairs by 3rd parties. Stop things before they get out of hand. Also, can’t stand glued lights. Gimme my Convoys to turn into supped up hot rods that melt plastic..
Or go a totally different route and make some very unique like a 3500K BLF GT. I’ve had a handful of lights I did emitter swaps on, like my BLF Q8, that turned a once in a while play thing into a light I take with me when I travel. I can send a vhs sized box from the USA USPS Priority Mail to China for about $35 (I just did this). That’s legit what the post office calls it. They also have a DVD size box. Almost every light I have ever owned has been modded in some way or another. Some lights are almost perfect but lack a good tint led. I would say emitter swapping is the number mod people do to there flashlights. 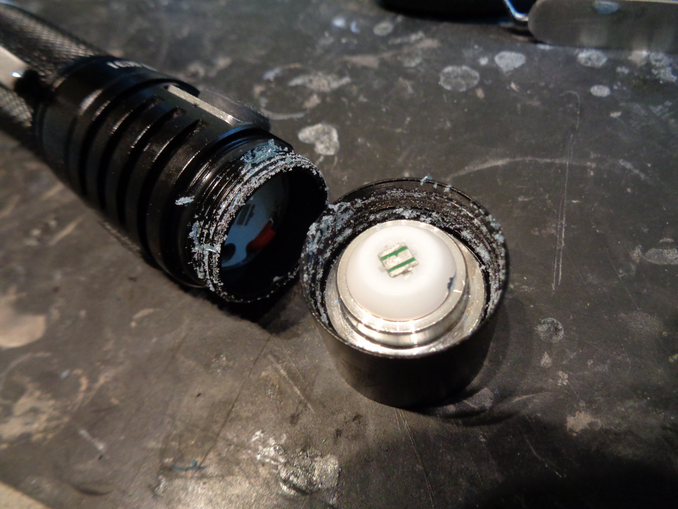 For example my Zebralight and Olight are both almost impossible just to do a simple emitter swap. I like the lights but Not nearly as much as a light I can have the emitter tint of my choice. 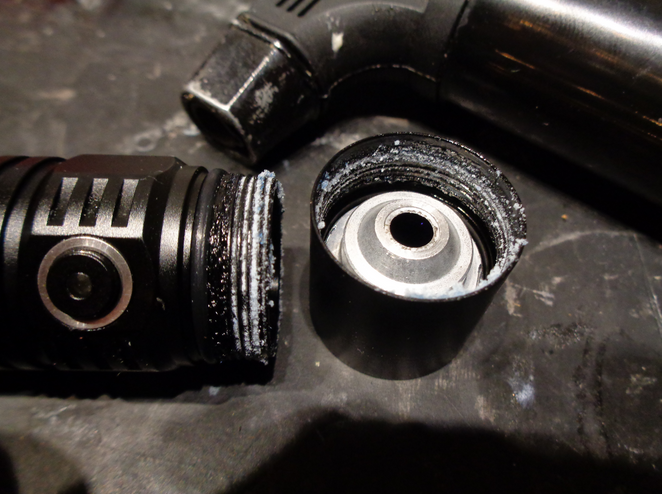 For this reason I do not want any glue or press fitted parts in my flashlights. Make them so they can be disassembled easily. Look around, you can find “DIY” flashlights in alot of places and are very popular. You can buy one and use what ever you like in it. Makes each individual have their flashlight just the way they like it. If you glue the light its stuck with what ever the manufacture thinks is good, which we all know they get it wrong more than right. Please, no glue, let us have our freedom to mod as we see fit without damaging the light to do it. Not with a tracking number for $35 bucks. The only tracking to China with USPS is with Express mail, and that costs about $65. Without tracking, there is a good chance your package will fall into a black hole and never make it to it’s destination. I think this is a worthwhile thread. I’m concerned though with the distributor actually making this happen. I’ve seen a few threads where the tint of the light was wrong when received and BG wouldn’t remedy anything based off the fact the customer received a fully functioning light that was ALMOST what they ordered. You’ll pay a small upcharge and then receive a glued light anyways. If BG doesn’t empathise when they send you a CW instead of NW they’re going to consider the glued light you received as a bonus that saved you from a light that could’ve fallen apart! I was not referring to you specifically with that remark, but more as a general “there are other opinions out there, even on the opposite end of the spectrum from what we think but they are still perfectly valid” remark. The upcharge is not set, well really none of it is. The upcharge was more an idea of helping to incentivize them to offer unglued versions. Put simply the manufacture has proven that gluing lights reduces the number of warranty claims they have to deal with. This costs them money of course. So there is very little incentive from their point of view to leave lights unglued since that leads to more issues they have to fix. I fully believe this as well, it makes sense honestly. The upcharge was simply an idea to help offset any extra issues they may have to deal with. I wanted to see what BLF thought of it before I pitch it to them as a way to mitigate losses from extra warranty claims. Also these unglued versions would be sold outside of BG for sure, banggood requests glued lights for the reasons above, it reduces the number of issues they have to deal with. The idea of complaining to banggood is it would make it’s way back to the manufacture and give them motivation to offer unglued versions for those that want it. All of this is completely unofficial at this point. So far I have only succeeded in beating my head against a wall, I am simply trying to get some facts to see if I can move things along. Please no glue. I won’t buy the light if I know it is glued. I really hope Sofirn will also listen to our request to stop using glue. Makes sense. Maybe the discussion should circumvent the distributors like BG entirely. If the mfg has the opportunity to make the entire mark-up and an added upcharge for a non-glued light then I feel like they would be more interested. I’m curious though how many mfg would offer this with the exception that it voids your warranty. I know modders know they lose their warranty but even then if there’s a problem with the driver or other warranty related claim they can’t repair? No glue please.I don’t mod my flashlights but I do clean them. Many lights have some dust or moisture that creates a fog in the head and that is a deal breaker for me. Sometimes chips or wires break their welds and the flashlight (that is glued) becomes useless. If it were not glued it can be repaired or modded by the end line user. I cannot think of an upside to the ELU in favor of permanent glue.